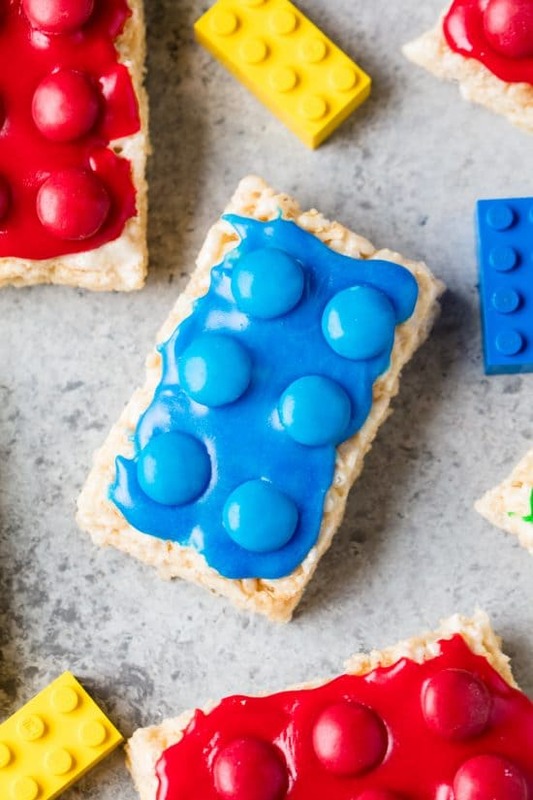 Lego Rice Krispie Treats are easy to make for your Lego lover. Great for a Lego birthday party, Lego themed allergy friendly treat for school, or just plain fun for Lego lovers! 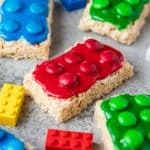 This fun recipe came about because my son wanted to have a Lego themed birthday party. I am not the craftiest person. In fact, I often refer to myself as the anti-craft. I just don’t have the patience for it! I knew I needed something super easy, and there’s not much easier than making rice krispie treats! 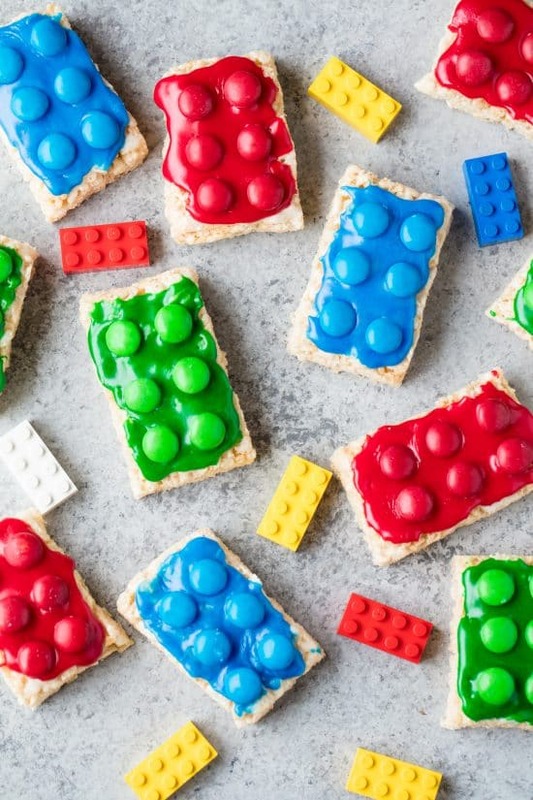 These easy to make Lego loving treats are just traditional rice krispie treats cut into rectangles, frosted with icing, and topped with M&Ms. It’s quite simple, but you may need a few tips to get you through it. Clearly I’m not the craftiest person so I always need some tips to make things cute! The key to making this recipe work is to use icing. Icing is not frosting! It starts out as a thick liquid and hardens when exposed to air. 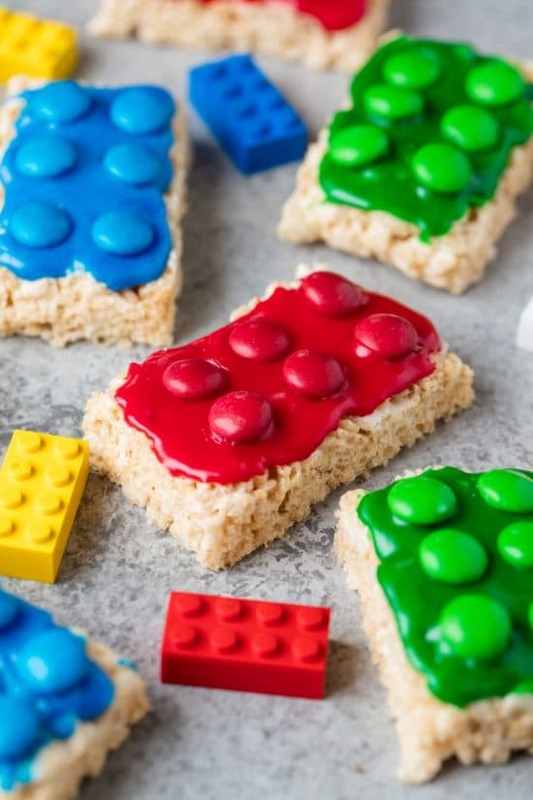 This works great for this particular application as the icing melts into the rough surface of the Rice Krispie treat and creates a smooth and shiny surface, much like an actual Lego. Bonus, because the icing hardens they can be easily packaged without smearing! You should be able to find cookie icing all made up and dyed in the baking section of your supermarket. If you want to make your own homemade icing, you can find a recipe HERE, but that does complicate things so if you are shooting for an easy food craft, stick with store bought. You can use whatever colors you’d like, just make sure you have coordinating colors of M&Ms. Cool your rice krispies completely before cutting. Use one color of icing at a time because the icing will harden quickly. Spread the icing gently with a knife, but don’t add too much icing as it may spill over the edges. Pour Rice Krispie cereal into a large mixing bowl. Set aside. Melt butter in a saucepan over low heat. Once butter is melted, pour in mini marshmallows and stir constantly until marshmallows are completely melted and smooth. Pour marshmallows over Rice Krispies and stir together until completely mixed together. Scoop Rice Krispies into a lightly grease 9x13 pan. Press down using a piece of wax or parchment paper until flattened. Let cool completely before proceeding. You can pop them in the fridge for 5 minutes to speed up the cooling. While the Rice Krispies are cooling, separate out the M&Ms into colors that match the icing you are using. You will need 6 of the same color per Lego Krispie. Cut Rice Krispies into 18 rectangles. Squeeze some of the icing into a bowl. Dip the top of the Rice Krispie treat into the icing and use a butter knife to smooth it out. Place M&Ms on top in parallel rows of 3 while icing is still wet. Repeat with remaining Rice Krispie treats in varying colors of icing. I love this recipe! Made them for my sons 4th grade class for his bday treat and they were a hit. Thank you! Thank you Sooooo much for sharing! I’m planning to make them tomorrow for my son’s birthday (30 years old & pilote!!!). A “HUGE-LEGO-FAN”! I’m looking forward to seeing ”Surprise/Joy/Happiness/Childhood Memories….” on his face! I just saw this post from seeewmamahsew handmade holidays looks great, and easy enough for me to make. I was wondering how well these would ship, maybe in a decorative tin. I think they would ship quite nicely. Just make sure you package them in some sort plastic so they don’t dry out. You are awesome! Thank you so much for sharing this! I will try it for my son’s birthday party next week. Great Video! Thanks!! There were some great tips in there! Did you ever try candy coating instead of icing? I think that might work because it will harden as well. What do you think? I haven’t personally tried that, but I’m fairly certain it would work out just fine. If you try it, come back and let me know! Did you ice over the m&ms too? I am planning to make these for my son’s kindergarten graduation. Also, how long do you think they would keep? (How far in advance can I make them? No, don’t ice over the m&ms. You can watch the video to get a better idea of how they are made. They stay good as long as regular price krispies treats which last a few days. This worked wonderful. I only did one thing different. Instead of putting the icing in the bowl & dipping the top of the treat in, I just squirted a little icing on top of the treat & spread it out with a knife. They were a success at my grandson's birthday party. Thank you for the instructions! Dear Rachel, these are so clever. I have four boys in the house. While I have a love hate relationship with legos (stepping on them in the arch of my foot during 2 a.m. bathroom visits), these are the cutest things ever. Super job and instructions, your son must have loved them! Thank you! I'm sorry – I completely missed the video! Duh! Do you have a recipe for the icing you used? If you watch the video you can see the exact products I used. I chose not to make my own icing because it can be a huge hassle to work with since it dries so fast, and it can be hard to get the really vibrant colors. It is very unlike me to not make things completely from scratch, but in this case it is what I opted for.